Roberta Gladys Venturella, of Cullman, passed away on Sunday, March 17, 2019 at the age of 94. Mrs. Venturella enjoyed gardening and working outside with her beautiful roses and other flowers. She was meticulous at keeping her house clean, she loved to cook and spent a lot of years sewing and quilting. For 50 years she lived in St. Louis, each time she came home for a visit, she and her family would play Rook, this became a special occasion to them and they all hold fond memories of those games. She is preceded in death by her parents: Burl and Lula Mae Vance Lynn; husband of 50 years, Benny Venturella; brothers: Wilburn, Wilford, Jack and Wayne Lynn and sisters: Ogene Williams, Willadean Elliott and Ola Mae Jackson. She leaves to cherish her memory her daughters: Brenda Healtherly and Wanda (Dean) Jenkins; grandchildren: Debra (Eddie) Willoughby, Kim (David) Becker, Trina (Tommy) Garmon, Kelley (Terry) Cook, Keybo (Diane) Knight and Thelbert Heatherly; 12 great-grandchildren and 4 great-great-grandchildren. Her family will receive friends on Wednesday, March 20, 2019 at Moss Service Funeral Home from 6 p.m. until 8 p.m. 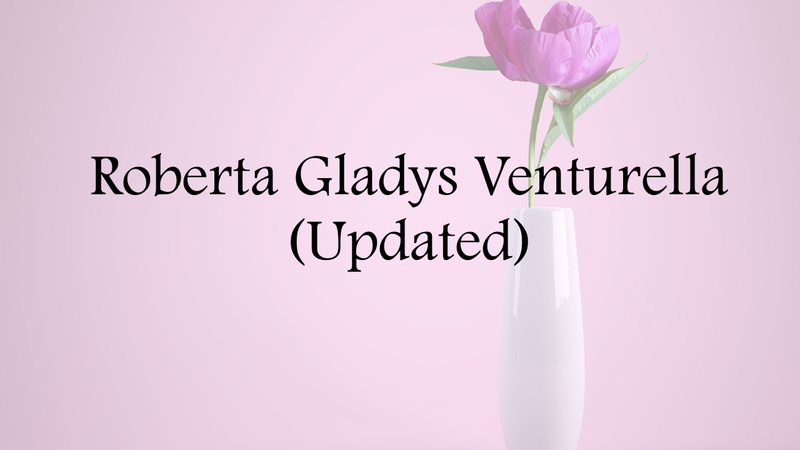 The Celebration of Life for Roberta Gladys Venturella will be held at Valley Springs Baptist Church on Thursday, March 21, 2019 at 2 p.m. with Bro. Scott Guthery officiating. She will lie-in-state from noon until service time. Burial will follow at Valley Springs Cemetery. The family would like to give special thanks to Kindred Hospice and all of the caregivers that took such wonderful care of their mother and grandmother. Special thanks to Sara Flack and Ann Wood for all of your love, support and care.